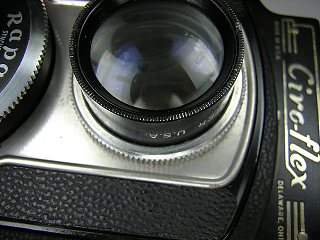 It is very normal that the lens of a camera gets dirty… especially for TLRs that are at least 20 years old. Very often photographers need to clean their lens. Many time i have seen newbies that using inappropriate method to clean lenses that almost destroy the surface coating. Below is an articles from bhphotovideo on how to properly clean a lens. The first question most people ask when shopping for a new lens is “Is it sharp?”, yet if you were to pop the lens cap off that new lens a month down the line there’s a 50-50 chance you’ll find dust and a fingerprint or two on it. And if it’s not on the lens, there’s a 50-50 chance there’s dust or a fingerprint or two on the “protective filter,” which was purchased to keep dust and fingerprints off that new lens. And that’s on a DSLR. If it’s a point-and-shoot camera, there’s even a greater chance of dust or fingerprints on the lens because when you turn the camera off, the lens usually slips behind little louver blades that A) protect the lens, and B) hide the fact there’s dust or a fingerprint on the lens. Checking your lens for dust and smudges is something you should do on a regular basis, not only to ensure you’re getting the sharpest possible pictures, but also because a fingerprint or alien smudge left to “ripen” can cause permanent damage to the lens coatings. Keeping your lenses clean isn’t rocket science, but nonetheless, is a chore that should be performed carefully, thoughtfully and with the proper tools and techniques. Dust and smudges on the front element of your lens (or your filter) are the easiest to spot because they’re front and center. 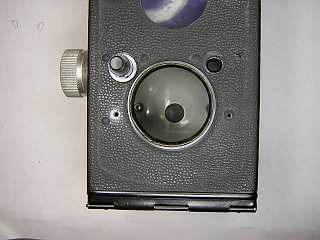 While dust and smudges on the front element can diminish sharpness and contrast levels, you lose greater levels of sharpness and contrast when you have dust or smudges on the rear lens element because that’s the one that ultimately projects your image onto the camera’s sensor (or film). If your “projector lens” isn’t clean, your pictures won’t be sharp as they can be. The surface of your camera’s lens has special coatings designed to maximize contrast, color saturation and color fidelity as well as minimize flare. These coatings can be scratched easily, and as such, when cleaning your lens it’s always a good idea to keep things simple. If dust or loose grit is the only villain, the best way to get rid of it is to gently brush the surface of the lens with a soft, camel-hair brush or give it a few blasts of air using a bulb-style air blower. Avoid using pressurized canned air. 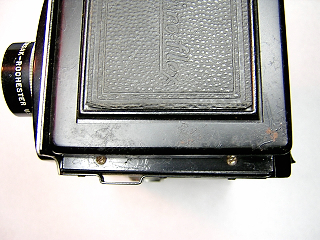 Avoid grinding grit into the lens surface with a cleaning cloth. Smudges and fingerprints take a bit more effort, and here too, you should be as gentle as possible. Start by taking a soft micro-fiber cloth or a piece of lens tissue (folded, not bunched up), breathe onto the lens surface (never dry-clean a lens) and gently wipe the lens surface in a circular motion. Repeat if needed using a fresh piece of lens tissue or clean portion of the micro fiber cloth. If this doesn’t work, try dampening the tissue or cloth with a few drops of methanol (wood alcohol) or alcohol based lens-cleaning fluid and try again by gently wiping the lens in a circular motion. Alcohol or lens-cleaning fluid should never be applied directly onto the lens surface. 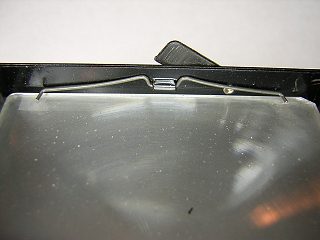 Doing so can possibly harm the lens coatings and/or compromise the adhesives that hold the lens elements in place. If you’re out on a shoot and need to clean dust or smudges off your lens, and do not have a micro-fiber cloth or lens tissue with you, a cotton t-shirt or similar cotton-based material (preferably old and not freshly starched) should do the job equally well. What you never want to use is facial tissue, paper towels, polyester-based material, or any type of coarse or abrasive fabric or paper surface. 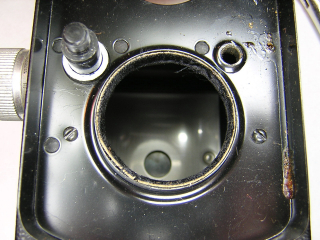 If the above procedures fail to do the job, or if gritty particles that can scratch the lens coatings are embedded in the smudge, you’d be wise to have a qualified technician address the problem. 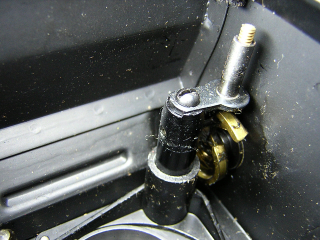 If you can see a few bits of dust floating around between your lens’s inner elements, they’re not worth fretting over, as they will have little if any visible impact on the sharpness levels of your photographs, and are certainly not worth the time, trouble, or expense of having the lens taken apart, cleaned and reassembled. A common misconception about dust is that you can see it in your camera’s viewfinder. The truth is the specs of dust you see in your viewfinder are not on your lens, but on your camera’s mirror. These dust marks, as distracting as they may be, do not affect your picture quality. Now before you take your lens off and try to clean your mirror, be advised the mirror in your camera is a surface-coated mirror finish, which can be permanently scratched with little effort on your part. Never, ever try blasting dust off with canned air, because you’ll most likely pit or scar the mirrored coating, or even blow the mirror off its hinges altogether. The most drastic action you should take is to try removing the dust particles by gently blowing them off with a bulb-type air blower. If this doesn’t do the trick, bring the camera to a trained technician or simply live with it because as noted above, dust on the mirror is annoying, but will not affect your picture quality. Dust marks on your image files―specifically, blurry smudge-like marks that appear repeatedly on the same portions of all of your image files―are caused by dust on your camera’s imaging sensor. 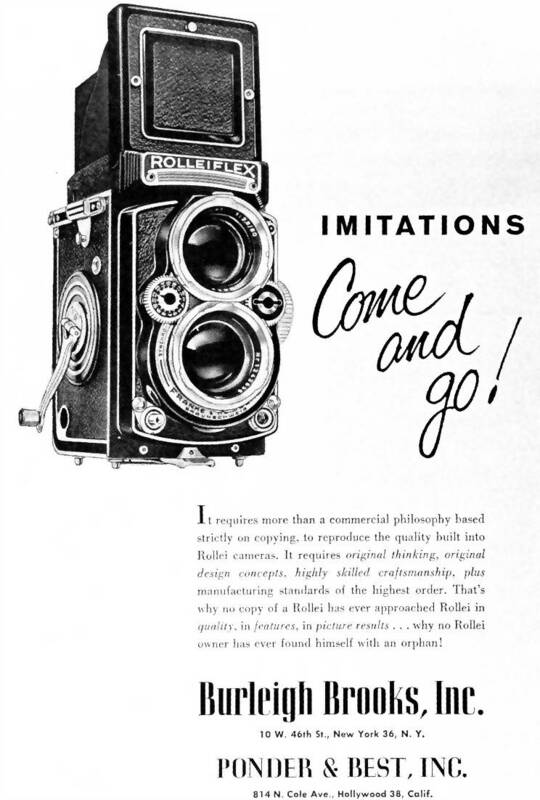 Here too, the most drastic and least invasive action you should try on your own is to remove the lens, set your camera to the mirror-lock position, and gently blow it off with a bulb-style air blower while holding the camera face down. If this does not work, it’s recommended that you have a trained technician clean your camera’s sensor. 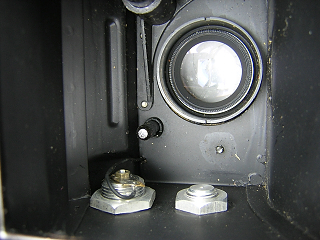 And just as you should never blast your mirror with canned air, the same goes for your camera’s imaging sensor. Kyphoto.com is one of the most reliable and resourceful sites for camera repair information. They provide a list of useful camera repair tools, which are asked by many people. Are you a DIY guy trying to fix or rescue your own precious cameras? If yes, there are the tools that you need. Niwa brand drivers are our favorites because they have big handles and the replaceable tips are very strong (but it doesn’t mean they are unbreakable!). The T-handle is a nice addition. A Sears set of six (4 slot and 2 phillips in a blue plastic case) is handy to keep around when a special size blade needs to be ground. This set is cheap and made of good, hardened steel. Don’t think one can ever have too many different pliers. Sears has a set of 4 mini pliers that is a good start. A tool should be comfortable… A set (round and pointed nose) of 4″ Visegrips are excellent for holding parts during filing or precise bending. A set of cheap fixed tip snap ring pliers with the tips filed to fit pin face screws. Only use this if the screw is so tight the friction screwdriver won’t remove it. The plier set you see in this picture was bought at Sears for $9.99. Plastic surgical tweezers are the best for general parts handling. They are big and stout. But a set of metal, straight and curved, are sometimes required. Depends from person to person and job to job if spanners are necessary. Especially on really tight lens rings they are invaluable. The replaceable tip ones are best. Also S. K. Grimes makes an excellent looking spanner. A cheapie set of 10 different cross-sections has worked fine. 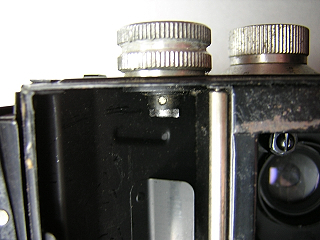 If I had a nickel for every time a friend has shown me this “broken” camera and all I did was put in a fresh battery… well, I’d have at least a dollar! Seriously, keep a set of various batteries around. I have a short length of wooden 2×4 with holes drilled in it to organize my batteries. Most camera shops carry cheapie filter ring removers. The big plier-like ones seem best. I don’t have a set of these big, nice…expensive…ones, but they are on my Christmas List. Next to my Tee-handle Niwa driver I use this the most. Could be my aging eyes?? I use it in diagnosing parts or checking lens element cleanliness, as a face shield while making parts with the rotary tool, any time I solder… gosh, all the time. Sears offers a nice 5 speed model. When you advance into making/modifying parts this tool will be your closest friend. I’m amazed that of my numerous bits I only use about four 99% of the time. Cutoff wheel, pointed grinding stone, rasp (looks like an end-mill) and a small ball tipped cutter. The first three are 1/8″ shank and the last is 3/32″ shank. I use a 45 watt Radio Shack pencil type plugged into a variable temperture control unit. My favorite tip is a spade type I bent to about 45 degrees. Make from a short length of round wooden dowel (or broom handle). Just glue a piece of flat rubber on the end. A couple different diameters is handy. These are used mostly for removing the ring around wind levers. I use it even if the ring has grooves. Makes excellent spring hooks and probes. I use a set consisting of US10, 12 and 14. And I have an extra bent US10. 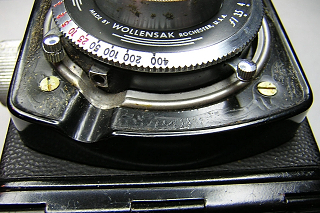 The 10 is especially useful for spinning off lens rings after initial loosening. For internal cleaning… Flat ones are better than the pointed. For loosening anything you don’t want to scratch…like everything. Start collecting various soft rubber pads. Anything can be used: furniture foot pads, sink stoppers, door stops…anything. A few sheets of soft rubberized cloth (dental dam) works well. Don’t know about you but my desk gets cluttered with tools when I’m tinkering. The best thing I have found to organize the tools currently being used is a 78 cent plastic drill bit holder. 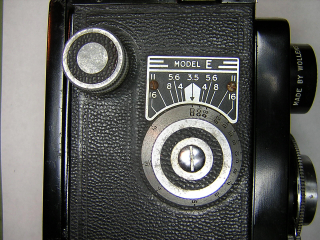 It is made to hold 26 bits from ½” to 1/16″. Holds everything from pliers to screwdrivers to…well, everything I normally use. Alternately a piece of 2×4 with custom drilled holes would be perfect…but for 78 cents, I can be lazy. To find and pick up small parts you WILL drop. Best for pin faced screws like shutter speed dial screws, self timer screws, etc. 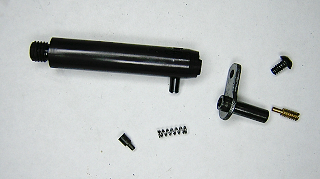 To insert in between the fork of the rewinding shaft to unscrew the rewinding knob. Does not scar paint as opposed to the normal screwdriver handle. 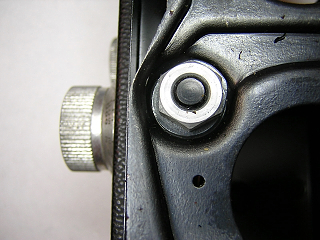 Once the retaining ring is loosened, unscrew the remainder with one or both of these two items. Inkpen (no ink, of course), if extra strength is needed. Toothpick, for smaller notches and good for depositing small drops of lubricant or glue. Need to store a bunch of little parts? If you shoot Fuji film like I do, you can write the camera name on the side of the white container. I have three or four from off brand film that are clear. They are the best. If one is good, then two is better and seven is perfect. Six empty film cans fit perfectly around a center can. Rubberband these all together and you have a great place to set those opened tubes of glue, thread lock, teflon oil, epoxy, etc. Also great for thicker tools like the friction screwdrivers and small butane torch shown. A ton of mini pliers will fit in them too. Excellent for cleaning lenses but I use it for cleaning everything on the camera exterior. For regluing leatherette mostly but works fine holding curtains and curtain straps to their shafts. When gluing curtains and straps clamp tight for best bond. The nice thing about Pliobond is that is doesn’t dry stiff. Good for dissolving old grease and flushing out dirty mechanisms. Caution: Ronsonol is very flammable…duh, it is lighter fluid. Coleman campstove fuel works fine also but stinks to high heaven. Use sparringly on pivot shafts. Apply with the tip of your smallest slot screwdriver. Radio Shack carries a couple different types in handy tubes. Thick molybdenum disulfide grease. Good for high surface stress areas or use as focus helix damping grease. Also very useful for holding aluminum/brass screws of old Kodaks to your screwdriver. Just apply a small ball of moly on the driver tip and stick on the screw. It’ll stay stuck there until you start the screw. This is gun oil. I use it as penetrating oil. It can be a mess to use but it frees shafts and pivots well. On older cameras I usually flush with Ronsonol after the parts free up then blow everything dry and apply Teflon lube to the pivots. On newer cameras made of harder steel parts I skip the Teflon lube and run dry. (in some types of fingernail polish remover) Use to unstick stuck screws. Get the finest grain size you can find. I use graphite as a manually applied plating. I massage it on contact surfaces until the color slightly darkens then blow out all stray graphite. Very good for aperture/shutter blades. Can repair most broken parts that don’t see high stress. To clean lens elements. My favorite technique is to fold the Kleenex in small squares and hold with round tipped locking tweezers. Do not touch glass with tweezers nor apply pressure. Wipe in circles, do not scrub. And change the Kleenex if ANY dirt particles can be seen on it. These particles WILL scratch the glass! Exterior cleaning and as a placemat for the camera to protect both camera and desk from scratches during assembly/disassembly. I prefer an old washcloth in lieu of the paper towel as a placemat. Micro-Tools sells several paints and coatings that sometimes even match the camera color! An essential cleaning tool. An air compressor set at about 40 psi with a pencil tip is best and by far cheapest but my wife won’t let me bring the garage compressor in the house. To measure things… What else can I say? Generally only needed when making/modifying parts. Circuit testing. And if you have a digital, one check out the shutter speed tester you can make using it. A description can be found in test equipment section. Like the dial vernier, not used very often.